When Melody Grace McCartney was six years old, she and her parents witnessed an act of violence so brutal that it changed their lives forever. The federal government lured them into the Witness Protection Program with the promise of safety, and they went gratefully. But the program took Melody’s name, her home, her innocence, and, ultimately, her family. She’s been May Adams, Karen Smith, Anne Johnson, and countless others–everyone but the one person she longs to be: herself. So when the feds spirit her off to begin yet another new life in another town, she’s stunned when a man confronts her and calls her by her real name. 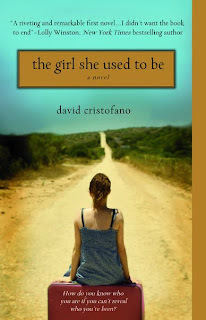 When I received my copy of the girl she used to be, by David Cristofano, I was immediately drawn to two elements that I don’t usually notice: the cover art (the back of a girl, sitting on a suitcase, staring down a long road) as well as the reviews on the back of the novel (which included “Riveting and remarkable!” as well as “Something special.” from the New York Times Book Review). With the beautiful artistry of the cover and the rave reviews on the back, I found myself drawn to reading this book right away with anticipation of its contents. I wasn’t disappointed. Right away, I felt engaged in this novel about a woman who is part of the Witness Protection Program. Melody Grace McCartney, along with her parents, witness a murder when she is 6 years old and, for the next twenty years, Melody finds herself changing identities and travelling around the country as she tries desperately to fill a void within herself. After she engineers her latest move (based on veiled suggestions that the murderer her family testified again, and who is patriarch of a Mafia family, has been in contact with her), she discovers that she is like the boy who cried wolf – she has actually been followed, for years, by the Mafia family after all! Kidnapped by Jonathan (“Johnny”), the son of the Mob boss, Melody finds herself in a whirlwind of emotions as she becomes the object of a tug of war between the US Marshals and Jonathan. Melody makes a decision to recapture her life. Will she take the offer of the Witness Protection Program to take on another identity, or will she take Jonathan’s offer to face his family in the hopes that they will finally allow her to live freely and without fear? I was completely and utterly amazed by this novel! I thought that the plot was fresh and unique and that the characters were well-developed. I found myself sympathetic to Melody’s plight because I could not begin to imagine how difficult it would be have your old life taken away from you and having to live under assumed names with no real past and no real future. I also felt sorry for Melody because her rash choices as a teenager had, indirectly, led to the death of her parents and the guilt that she felt was obviously enormous. I also felt myself growing attached to Jonathan and I could see why he and Melody were drawn to one another – both felt like prisoners in their lives, though for different reasons. I also appreciated the sacrifices made within the novel and the irony of its ending. Overall, I was really impressed by the caliber of writing and the fresh originality of the girl she used to be. I was also surprised at how well Cristofano was able to write from a female perspective and I enjoyed the section after the novel where he writes about why he decided to write from a female perspective and how he was able to gain insight into the female psyche and apply it this novel. I would wholeheartedly recommend the girl she used to be to anyone who loves fiction! It truly is a great literary work – it has many layers to it and would make a great book club novel as well as it has discussion questions in the back.